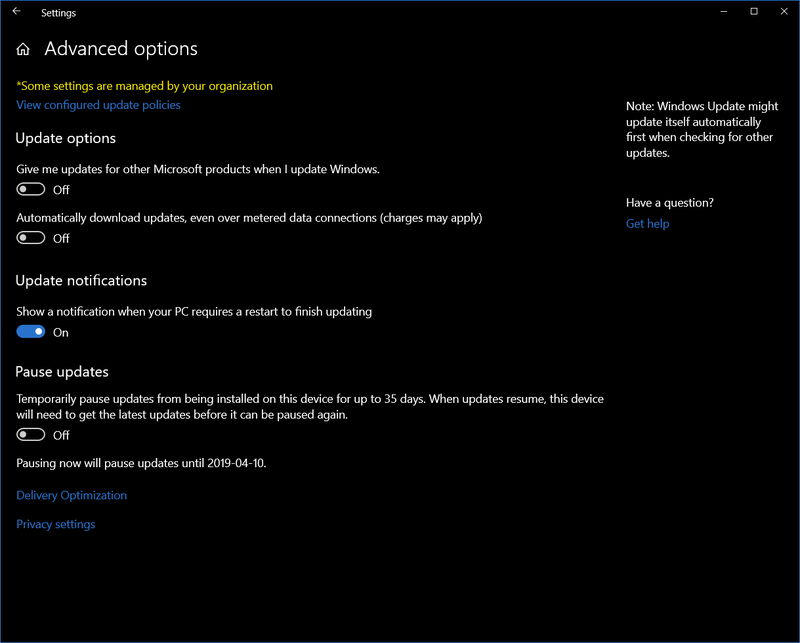 Win10 1903 Pro Windows Update advanced options — WUH? 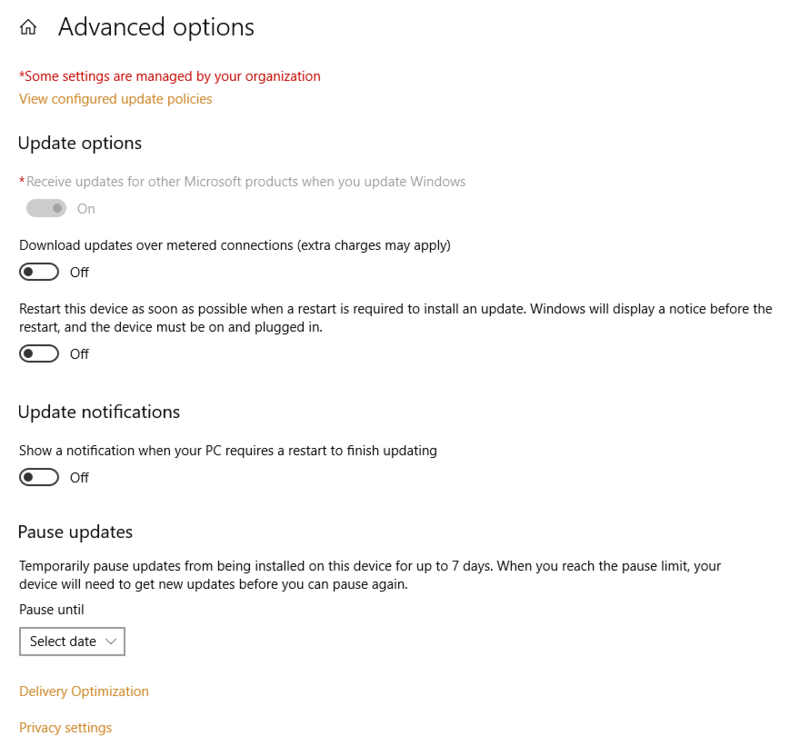 Home › Forums › AskWoody blog › Win10 1903 Pro Windows Update advanced options — WUH? This topic contains 74 replies, has 26 voices, and was last updated by anonymous 1 month, 1 week ago. @teroalhonen reports that he has an Advanced Options pane just like my first one. I have no idea what’s going on….. So yours is exactly like mine. What in the world…. ????? So, it looks at first glance everyone (Home or Pro) will be updated to the new Build within 7 days of release. More Beta Testers for Microsoft early on. Even not all of the consumers with the Pro version dig in Group Policy or the Registry. Seems MS is moving the mindset to having no control in preparation for Microsoft 365, where the rented OS is online and there IS NO control over what changes are made and when they are applied. But why does Tero have a different Advanced Updates dialog? Does he say what version and what Build? His screenshot says 18343.19h1_release.190219-1422 (Evaluation Copy). More fuel for the fire…… here’s what I have on my work-managed Windows 10 Enterprise 1809 system, which doesn’t have the February 2019 updates installed. No sign of the old GUI with the big drop-downs anywhere. A similar change in Advanced Options happened to my system (Windows 10 Education 1803 17134.590) within recent days/weeks, where the settings for the number of days that one could put off the two types of updates have disappeared. Not sure if it’s a February update matter or if it’s some changed configuration that our IT folks pushed out. If you’re on WSUS, you don’t get the SAC-T/SAC dropdown options. That’s likely the reason for warrenrumak’s problems with 1809. But it doesn’t explain my 1903. I don’t have WSUS on any of my machines, and this machine isn’t under AD or AAD (per @getwired’s tweet). I’m tempted to blast it away and install the new ISO – but I’m also concerned that this may be a for-real bug. Or feature. So I’ll hold off on installing the ISO for now. Exactly, WSUS overrides your settings, thus no drop-down-menus. I wish I could use WSUS at home for my own computer, I could pause these updates foreva 🙂 this is screenshot from our company 1803 build. This is just crazy. It’s my understanding that even Apple doesn’t do this with new IOS builds. I have photographer friends who delay these updates for some time because of Apple plays fast and loose with color management issues. It will be a shame if MSFT goes down the road of taking user control away from us. We already pay a premium for the PRO version so that this stuff can be carefully controlled. I’ve already been forced to update to Win10 because Adobe won’t support it’s photo editing programs on Win 8.1 any longer. I can see some disasters looming ahead when a new system update is installed and my software doesn’t work for a period of time until patched. Stripping the 35-day delay option from the Pro version? That’s just cruel. If Microsoft ends up removing the deferral options in group policy settings, then [edited]. And now it seems that not even Windows 8.1 is safe from major update bugs going forward. I’ve been rushing updates during the previous two months, but this time, I’m slamming the brakes on updates until at least next month! Microsoft needs to keep the extended delay options via group policy on Win 10 Pro or there are going to be millions of burned-up customers. Refusing to return to Windows 10, when my PC is declared Linux-ready, Windows 8.1 will be put into sudden-death mode. One crash and it’s over for Windows. Going to have to seriously think about taking important systems completely offline with an air gap and no wifi. This is ridiculous. Why do we have to treat M$ like a hacker trying to push malware on our machines? That’s not it. The only GP setting applied to my desktop system is that Dual Scan is disabled. (i.e. the internal WSUS system is the sole provider of updates). I have full control over Windows Update otherwise. This is about v1903, not v1809. Understood. warrenrumak made the point that his 1809 had the same lack of options as what’s being seen in 1903. Again, EXACTLY why I’m not moving to 10. They just keep getting worse and worse. I’m not “renting” a terminal inside MS Shop (despite how they see people as “licensing their OS”), this PC is sat in my home, it is bought and used for what ‘I’ need it to do, it should work and be updated when ‘I’ wish. What’s next, Microsoft telling me what software I can install or uninstall, and when I can use it? It’s absolutely ridiculous people are accepting this at all. I’d have imagined only grandmas and businesses would put up with such treatment. I went to update Handbrake yesterday. It requires .Net 4.7.1. I’m still on WinX 1511. Yup, 1511. Read my older posts and you’ll get the story. In any case, I could not install the latest version of .Net, thus no Handbrake either, because MS decided that I can’t install 4.7.1 on this version of windows. So, your prophecy is already reality – MS will control which software you can install by controlling the sub-components 3rd party software requires. Interesting that the .NET update in question can be installed on 7, 8.1, but not the build of 10 you are using. That’s the other side of the rapid update schedule… even if you can block the unwanted feature updates, it doesn’t mean the old version you’re still using is going to work. Even the coveted LTSC/LTSB wouldn’t be much help here. You’ll get your security updates, but that won’t always be enough. This is the new normal in Microsoft-land. Accept that MS calls the shots and will do as it pleases with your PC, or find some way to move off of the platform. Not everything people need to run is available on MacOS or Linux, or on mobile platforms, or on a Chromebook, but those are your choices. MS is banking on the hurdles to getting off of their crazy train being too high, at least in the short term. In this case, at least, Handbrake has versions on Mac and Linux too. If only everything did, Microsoft wouldn’t be able to get away with their heavy-handed antics. Interesting that the .NET update in question can be installed on 7, 8.1, but not the build of 10 you are using. I know some software on 7 will eventually get to this stage too, but I’m hoping by then, there will be a more suitable alternative. Or I’ll just end up on Linux. It is not that surprising to me that you can’t install a newer .NET version on an unsupported version Windows 10. It is likely that changes in Windows after 1511 the .NET 4.7.1 depends on or changes in .NET that depend on changes in Windows after 1511 preclude installing it on 1511. You chose to remain on a version of Windows 10 which has been unsupported for 17 months as an experiment to discover the consequences. Well, you just discovered one. You are controlling what software you can or cannot install, not Microsoft. The latest Handbrake has OS version requirements for Mac and Linux too. So yeah, .NET 4.7.x cannot be installed on Windows 10 1511. I just tried to do so on a VMware virtual machine running Windows 10 1511 Enterprise, and the .NET 4.7.2 installation program told me it “is not supported on this operating system”. Note that Windows 10 1607 or above can run .NET 4.7.2, even though many of the compatible Windows 10 builds are already out of support (at least the Home/Pro version). So it seems that you will have to either stay on an older version of Handbrake (Personally I still use 0.10.5 myself as I see no point in updating Handbrake at present.) or you will have to update your Windows 10 build to a more recent version (or install Windows 7 or 8.1 on which you can still install .NET 4.7.x). Most people do not care about updates. They do not want to postpone updates. They just want to use their PC. Those of us who are enthusiasts or have a specific reason not to update are the ones who may care. You have to remember that forums like this one emphasize problems which do no affect the great majority of users. ‘less is more’ takes on a whole new meaning with MS, they must be confident about their patching framework. Thank Woody for the MS-Defcon system and Susan’s Master Patch List is all I can say. So, it looks at first glance everyone (Home or Pro) will be updated to the new Build within 7 days of release. More Beta Testers for Microsoft early on. Even not all of the consumers with the Pro version dig in Group Policy or the Registry. Seems MS is moving the mindset to having no control in preparation for Microsoft 365, where the rented OS is online and there IS NO control over what changes are made and when they are applied. They’re getting me ready to switch to Linux Mint at the fist sign of a serious issue. I’ve already fully tested it. It works great and found my networked printers faster than Windows 10. Since I sell and service Windows 10 PC’s, I really don’t want to stop using it. But, when the time comes, I’ll make the move. I’ve already been promoting Chromebooks with customers that don’t use any installed programs on Windows, only online sites. I loan them my almost six year old ThinkPad Chromebook to try. No one hates it. Some already switched. I wonder if Microsoft is intentionally driving consumers away from Windows. I installed Fedora 29 on my friends mothers PC, so she can just to look on the internet, read some emails, etc.. No ads, no confusing OneDrive windows poping up, no Edge testing msftconnecttest, no notifications emerging from below, NO ANTIVIRUS.. I just installed OS and ask her, what the password should be. Done. Here is firefox, that is all you need. For some time now on 1803 and 1809: if you have any GP settings in the WU segment, the advance options screen gets truncated. My fear on this news is that some of the GPEdit – WU options that appear valid on Pro are in fact not: they are ignored. They only work on the ENT editions. Waiting to see if this is intended or not, but a potential scenario is that the feature deferral, even when set in GPEdit – might end up ignored on Pro sometime in the future. I really hope this is not the case! I don’t think I have ANY settings in the Group Policy “Windows Update for Business” folder. I’ve tried hard to avoid making any changes at all to Group Policies. The way I read this, it means that Microsoft is absolutely not backing down on its insistence of their definition of Windows As A Service, and where it’s being imposed on all users. In other words, not only two featureset updates per year, but near-zero capacity for deferral, even for Enterprise users (and heaven pity the poor schmoes that are paying for single licenses of Pro or Home editions). I haven’t seen any discussion in this context, but I get the impression that Microsoft is also trying to make it harder to suppress reporting of telemetry data back, as well. I guess that this corresponds with what @woody reported last week about revisions to Microsoft’s terminology, where it appears that they’re dropping the “ready for business” classification of the Current Branch for Business or Semi-Annual Channel (whatever they decide to be calling at the moment). It does seem that Microsoft’s attempts to elevate/escalate/accelerate updates (short of the originally-announced 3-per-year cadence) indicate that they’re getting significant customer resistance. Thus, their way of addressing that is to remove capacity for users to even defer updates (much less opt-out entirely) as much as possible. I guess that Microsoft has decided that the only way the WAAS works is that if *everybody*is participating with both telemetry reporting, and getting updates deployed as soon as Microsoft pushes them out. The fact that updates may be disruptive, and it seems pretty clear that decision-makers in Redmond have decided that whatever disruptions happen are an acceptable cost, and the proverbial “you can’t make an omelette without breaking a few eggs”. It wouldn’t surprise me if the decision-makers in Redmond may have concluded that the reason for the 1809 disaster happened because there wasn’t enough participation by early adopters. Thus, in response, force early adoption. For many of us, the objection to the frequent updates comes from the perspective that these are our computers, that we have businesses to run and work to get done, and that we can’t afford Microsoft imposing updates on us, when the chances are far too high that they may be disruptive. Unfortunately, all of that is addressed in the Win 10 EULA, of how Microsoft defines WAAS — even though we may provide the physical hardware, Windows belongs to Microsoft, and we’re merely paying for licenses to use it. And as a part of the EULA is what I call the “weasel clause” of contracts done under the Uniform Commercial Code — where they reserve absolute right to change the terms of the EULA unilaterally and in nearly any way that they choose. In other words, it’s Microsoft’s world, and we’re just paying licensing fees to live in it. I hear what you’re saying but… man, can you imagine what would’ve happened if 1809 had been pushed at a faster rate? Microsoft is just testing how much abuse the unwashed masses will accept before the revolution to Linux Mint or a Chromebook, and for those that can afford it Apple gear. A quote from the WindowsReport website: “On the other hand, Microsoft is facing criticism for releasing builds without fixing issues that are still there for the last 3 major updates. These bugs have been reported to Microsoft for months but nothing has been done yet. ” That quote is from 04 March 2019. MS is just preparing us for a monthly utility bill to rent the OS maybe? A quote from the WindowsReport website: “On the other hand, Microsoft is facing criticism for releasing builds without fixing issues that are still there for the last 3 major updates. These bugs have been reported to Microsoft for months but nothing has been done yet. ” That quote is from 04 March 2019. Based on reports which are 5 to 8 months old. The “nothing has been done yet” is blatantly untrue. Enterprise users have much more control over updates than regular folk. That control is usually exercised by the IT department setting rules which are enforced by Group Policy settings. Often special update servers are setup to handle the download, approval, and distribution process. Yep, but my test machine isn’t attached to a WSUS or SCCM network. No AD. An upgrade that carries a risk of rendering your PC unbootable? That’s just a chance Microsoft is willing to take! There is still a significant number of Windows users who have yet to make the move to 10. MS is still trying to convince them to move as quickly as possible, as they have been for three years plus. What we’ve seen from the inception of GWX (which started prior to the release of 10) to the present is Microsoft playing nice! If this is how they treat Windows users while they’re still trying to convince them that they should upgrade to 10, what will they do when Windows 10 owns most of the Windows market? Anonymous – Unfortunately, I think you are right. I am going to have to replace hardware soon, and that means I will be right into the Windows 10 pickle. It seems to me we are getting into the realm of abuse of market dominance, since most ordinary users do not have the realistic option of moving to Linux. In that case, the monopolies people ought to be getting interested, but I suspect that they have too much else on their plates, on both sides of the Atlantic, for there to be a realistic chance of them acting. Quel dommage. I have the same problem. In our org, we don’t allow use of abandoned software. Thus, Windows 7 and Office 2010 are no longer allowed after Microsoft abandons them next year, and each time Apple comes out with a new release of MacOS, we’re having to work with our Mac users to either upgrade to a more current version, or replacing hardware that can’t be upgraded to the oldest version that’s still supported. I agree with the the concept of market abuse here, and was thinking of that when I made my comment about EULA and UCC. Beyond anything that might be done from the prospect of antitrust (and I think that’s doubtful), I think there’s also reason to review the EULA terms, that may be reaching the edges of “unconscionable”, especially in light of the practical consequences of EULA-permitted activity that is being imposed on users. Perhaps if a Microsoft update caused real damage to a critical system (forced reboot or down system because of problems). But in the grand scheme of things, part of the problem is what is permitted in contract terms that are governed by the UCC. Unfortunately, unless there’s some sort of true disaster (both giga-$ and lives lost), I don’t think there’s anything that will force a review of what’s permitted in UCC contracts. Hm, Windows 7 technically won’t be abandoned at least until 2023, it’s just that you’ll need to pay for updates… which is sort of the default state for a lot of the more specialized software anyway. I agree with the the concept of market abuse here, and was thinking of that when I made my comment about EULA and UCC. … … Unfortunately, unless there’s some sort of true disaster (both giga-$ and lives lost), I don’t think there’s anything that will force a review of what’s permitted in UCC contracts. Internationally, this part is a huge can of worms. Consumer sales are fairly clearly governed by local legislature where the purchase was made, even for store-bought Office 365 year vouchers and such, and most certainly a retail PC with an OEM license. In Build 15048, which was released this past Friday, this option is still there but has been tweaked to reduce the number of days updates can be paused on a Windows 10 Professional system from 35 to 7 days. But you’ve recommended that no one should ever use Pause Updates anyway, so what’s the big deal? If this change holds for Win10 1903 (or 19H1, or whatever), & Pro has no availability to the “old” settings via GPEdit, then it’s useless to pay $100 for a Pro upgrade. I might as well move to Linux (Mint, probably) before 2019 ends. As I Still suspect, wearing my tinfoil hat or not, even if Win7 gets extended support that they must Pay for, Win8.1 will be targeted for the next 3 years with buggy updates. The goal being to force them to upgrade to Win10 whatever or give up & subscribe to Microsoft 365 when (if?) it becomes available. Thanks but No Thanks, Nadella & Micro$oft! I knew that I had a really bad feeling about this. Windows 8.1 stood out as by far the most stable OS during 2018, but its luck may be running out. I’m preparing my PC for the move to Linux, but until then, I’m strongly considering shifting my updates to Group B. M$ may be killing the Windows OS in order to develop something new. Windows 8.1 stood out as by far the most stable OS during 2018, but its luck may be running out. I’m preparing my PC for the move to Linux, but until then, I’m strongly considering shifting my updates to Group B. M$ may be killing the Windows OS in order to develop something new. I’ve already shifted to Group B with the October 2018 updates. In that month, KB2976978 started to be bundled with the Security Monthly Quality Rollup (Group A) for Win8.1. That’s the “Compatibility Update” required for a future upgrade to Win10 whatever. I basically decided to hold off; that KB still shows as Important, but I uncheck it every month. Woody thinks it’s related to telemetry, like KB3080149; a Recommended update that I skip because I unchecked the “Give me recommended updates the same way I receive important updates” box. As for “M$ may be killing the Windows OS”, I sincerely doubt that. Azure is its own OS; M$ would rather have people subscribe to Microsoft 365, if or when that happens. And I’m not sure that any Insider Previews ever had the options to defer feature or quality updates. Re the 7-day pause and the option to defer feature updates in Insider Previews: Are you saying that this is the case in the Settings GUI only, or in Group Policy also? I cancelled an order for a new box yesterday. It was to come with 10 Pro. With the watering down the Pro version is getting I may as well save the cash, use Home edition and stay with controlling updates via 3rd party utilities. Other required tweaks can be done via Registry as I have done with this machine for years. Once a new machine does arrive, I’ll start playing with Unix on this machine (if I can figure how to install drivers for a Samsung ATIV keyboard). I installed Build 18343 from scratch with the ISO file – the options for delaying feature- und quality-updates were there. I did the update to Fast Ring Build 18351 and nothing changed. That seems to reinforce what @b was saying. Do you have a watermark on your version? I am on version 1803, but I set the delays in the Group Policy Editor because I thought it might be more reliable. 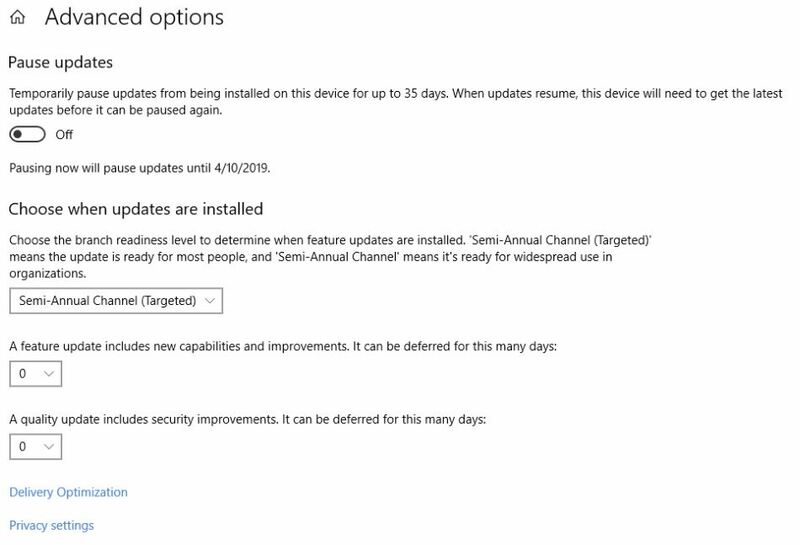 I still have the delay options showing in the Windows Update page under advanced settings, but they kare grayed out and cannot be changed there. If Microsoft removes them entirely, including group policy, that is a serious problem. The UI being greyed out is a result of a setting a policy. You’ll probably see “settings being controlled by administrator” or something like that. Does not mean anything has been or is about to removed. That may well be the source of my confusion… but why isn’t Tero on an Insider Preview ring? Perhaps the absence of a watermark is a clue. I’m going to speculate that installing the just-released ISO reinstates the deferral settings in the Setting app, but those who have blithely gone from build to build have gotten the stunted end of the update advanced settings stick. I’d further speculate that those running from the ISO have a watermark, while those of use who have been going from build to build lost the watermark. That would explain a lot. But I have no way of knowing whether it’s correct. Sure wish MS documented this stuff…. Microsoft does not want preview builds paused for more than a week. It makes no sense. The watermark is removed as we get close to an official build but I’ve not seen anything about it being removed in any of the release notes. Well now I’m really glad I held off on upgrading my Win 10 systems from Home to Pro. I had a sneaking suspicion it was only a matter of time until Microsoft crippled the ability to delay updates in Win 10 Pro. Now it looks like I was probably right about that (unfortunately). To anyone who got suckered into spending $100 for the Pro upgrade, you have my sympathy. But this is just further proof of why Microsoft can’t be trusted anymore. Microsoft has not crippled anything. See #338262 above. This all has to do with Insider Preview builds and the way Microsoft tests them. In the referenced post a clean install of build 18343 (a very recent build) HAS the update options. I totally agree. M$ is plotting to cripple all previous versions of Windows and force everyone to upgrade to Windows 10. What’s going to happen next, M$ sending a behind-the-scenes quality update for Windows XP and Vista, bricking those machines, and making the victims buy new PCs and MACs? It would not be surprising to see that happen. What’s going to happen next, M$ sending a behind-the-scenes quality update for Windows XP and Vista, bricking those machines, and making the victims buy new PCs and MACs? To be honest, I started considering and treating Windows 10 as malware. And over a year ago we left this out of control disaster. Hello Mac (for now, Linux systems will be added soon actually). We wasted way too much time on fighting against stupidly buggy and above all unwanted updates and upgrades. Keep in mind that for smaller companies lucrative business/enterprise contracts are far out of reach in matter of price. So it was not a very difficult choice. Since the switch, we can focus on creativity and production again. That’s what a computer should be for, it’s not a billboard for Microsoft. This just leaves me thinking… what could Microsoft’s long-term strategy be here? Getting rid of the desktop operating systems business altogether and proceeding to sell applications and services…? An integrated closed-source desktop environment sold as an application or SaaS style on top of an open-source core, maybe? I think that, when 1903 is released in April, both Pro and Home will be able to Pause for 35 days, instead of just 7. At the moment, the button only allows a pause for 7 days, but that’s because it’s an Insider build (i.e., a beta version). In the past, Insiders can only pause for 7 days, but when the version is released, the limit is bumped up to 35 days. 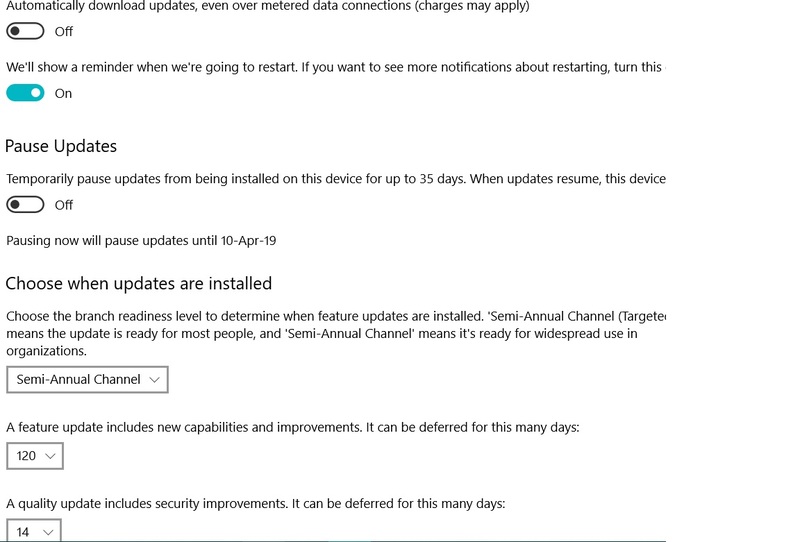 For those running the Win10 1903 Home beta, pause updates is limited to 7 days, but when it’s released, I think it’ll get bumped up to 35 days, just like the Pro version. I’ve been out of the loop for a couple of days and haven’t had a chance to check out askwoody.com. I’m glad I did! After reading that MS is going to put the clamps on W10 Pro updates, I almost fell out of my chair. I’ve been looking for a new laptop for awhile now and one of the things on the list was to include W10 Pro because of the ability to hold the updates until the coast was clear. This whole thing with Microsoft and updates, just doesn’t smell right. It more and more makes me feel like they are in bed with Big Brother. Come on Bill, what did you agree to? Woody you just saved me $100 bucks! Pro hasn’t changed; it can still defer and pause updates. I don’t agree. It looks like Pro is changing. Previously (or currently) Pro could delay updates by up to 365 days. But in the new version (1903) it looks like they’re cutting back the maximum delay setting from 365 days to just 35 days. So that would be a major crippling of the ability to delay updates in Pro. On the other hand, it appears that the Home version may also be changing — assuming that the reported/proposed changes hold up when 1903 gets finalized. That would allow Home users the ability (for the first time) to delay updates — and it would be by 35 days also, just like Pro. Admittedly this is all still speculation; since Microsoft and transparency seem to be mutually exclusive of each other. But assuming that 1903 ends up looking like the reports from Leopeva64, then most likely both Home and Pro will be able to delay updates by the same amount of time — up to 35 days. If that’s the case, then there’s no longer any justification for spending $100 to upgrade from Home to Pro at this point — not unless you need Pro for something other than delaying updates. But assuming that 1903 ends up looking like the reports from Leopeva64, then most likely both Home and Pro will be able to delay updates by the same amount of time — up to 35 days. Yes, but that’s just Pause (all updates). From Windows 10, version 1511 to version 1607 maximum was 180 days. From Windows 10, version 1703 to version 1809, the maximum is 365 days. Reply To: Win10 1903 Pro Windows Update advanced options — WUH?